With Pixar, I’m used to seeing original stories, but most of them do seem to be boy oriented. This year, Pixar’s offering is geared toward girls, and that means a princess film, which has been almost exclusively Disney’s territory in the animation business. 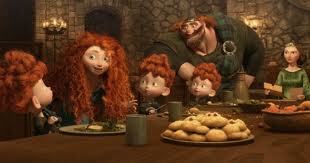 In Brave, an Irish royal family takes center stage. King Fergus, large, red haired, and with a crunched-up nose, likes to hunt and be wild, and his firstborn, Princess Merida, inherits this trait. His wife, however, is all about propriety, manners, and tradition. She lets her husband and triplet sons slide because they are after all boys, but she rules over her daughter with an iron fist. On her rare days off from being a princess, Merida goes rogue, wandering the countryside on her horse, armed with her bow and arrow. (This seems to be the ladies’ weapon of choice this year—first Katniss Everdeen in The Hunger Games and now Princess Merida.) After one of these jaunts, Princess Merida finds out that she will have to marry a suitor, who competes successfully for her hand, from one of the clans. Her mother explains that it’s tradition and she had to do this herself when she was Merida’s age. Strapped into a dress with her red curls obscured by a wimple, Princess Merida is introduced to the competing suitors the next day, and they are a sorry lot. Princess Merida and her father make fun of them while sitting on their thrones as each is presented. The problem is Princess Merida actually has to marry one of them. 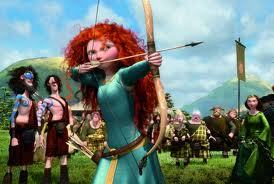 Deeming them all unsuitable, Merida takes things into her own hands and defies tradition. The men seem somewhat flummoxed by this, but it’s her mother who’s truly pissed, telling her that she’s embarrassed the men. The princess responds by ripping a tapestry, and her mother tosses her most beloved possession, her bow and arrow, into the fire. 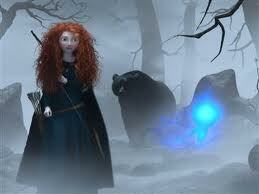 Princess Merida runs away and follows some magical will-o-wisps to a witch’s (no, woodcarver’s) hovel. This woman is conflicted about her abilities, but Merida divines what she is and asks for a spell that will change her fate. This witch/woodcarver complies and presents Merida with a big, fat cake and no certain directions. Somehow, Princess Merida knows what to do, and upon returning home, she presents the cake to her mother as a peace offering. The queen takes ill, and after being escorted upstairs by the princess, she turns into a large, hippy bear. This is where the story gets interesting. Due to a run-in early in life, King Fergus hates bears; he has an all-consuming passion to destroy bears, so it’s most unfortunate when the queen becomes one. There are funny moments when the queen tries to keep up her human traits while in bear form, and some truly terrifying ones where the queen forgets her human nature and starts attacking her children as a bear would. At the heart of this story seems to be the mother-daughter conflict that some may experience—the mother wanting her daughter to follow in her footsteps and the daughter wanting anything but. There are flashes of something a little darker, too, and I wish there had been more of this in the movie—what happens when a mother resists her maternal nature and instead becomes a monster toward her children? These are the things that Grimm’s fairy tales are made of and why those stories stick with me to this day. They hit a dark psychological truth that I can recognize in myself. There are glimmers of this in Brave, but in the end the story veers the way of happily ever after, complete with daffy songs and a too-simple resolution. I much prefer the theme of “mothers as monsters” rather than “the ties that bind.” Brave is a pleasant enough movie, but I can’t help feeling that it could have been so much more.